Group 21 astronauts. Back row, L-R: Hague, Meir, Hammock, Mann & Glover. Front row, L-R: Morgan, McClain & Cassada. NASA Astronaut Group 21 (nicknamed the "8 Balls" ) is a group of eight astronauts selected in June 2013. NASA announced the creation of this astronaut group in October 2011 and accepted applications for astronaut hires between November 2011 and January 2012. A near record number of applications - 6,372 - were received. The only year NASA has received more applications was in 1978 leading up to the Space Shuttle program. The Group 21 Astronaut Candidates (the term for a newly selected NASA astronaut who has not completed basic training and is not yet eligible for mission assignment) arrived at the Johnson Space Center in Houston for training in August 2013, which is expected to last approximately 2 years. The young class will join 47 other active NASA astronauts. One of the agency's long-term goals is to send a crew on a mission to a near-Earth asteroid by 2020, in preparation for an eventual trip to Mars. ^ Pearlman, Robert (20 August 2013). "NASA's new astronaut class, the '8 Balls,' reports for training". CollectSPACE. Retrieved 22 August 2013. ^ NASA. 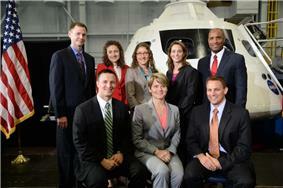 "2013 Astronaut Class". NASA. Archived from the original on June 21, 2013. Retrieved June 20, 2013. ^ "Near-Record Number Apply For Astronaut Corps". Florida Today. 1 February 2012.